I feel like this outfit is the epitome of summer dressing. It's easy, casual and comfortable for the heat and humidity (bless you if you live somewhere with no humidity #jealous). Madewell seems to always be one of those retailers that have such easy summer options. 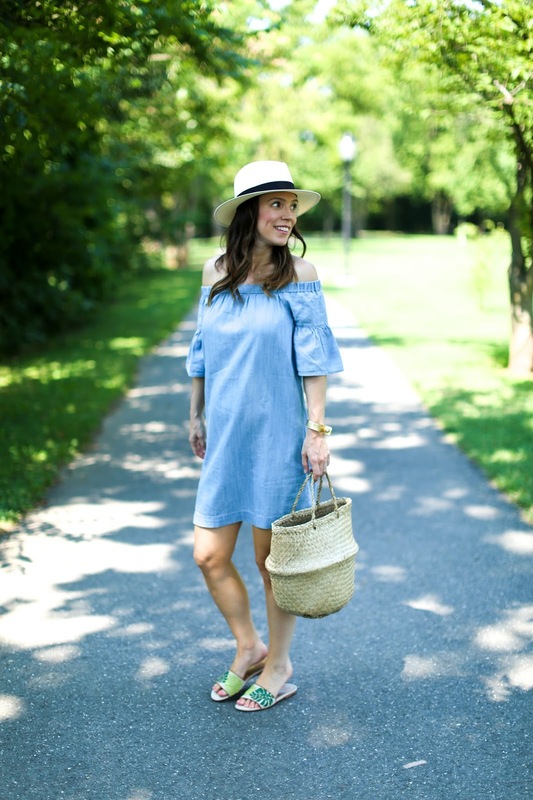 I shop there all year long but I find that I am always drawn to their warm weather styles. Their shoes and accessories are hit or miss with me however. I wish they did cute prints like these palm print slides I'm wearing in this post. They are not super supportive but I wear them at least once a day because they are so easy to throw on and go. Whether I'm walking Elmo, running for coffee or actually going out for the day, they are my (quick) shoe of choice. I have to say that I have been loving my drier skin recently because I enjoy faking a glow with makeup. And after being out and about all day, I never struggle with an oily t-zone and that has been a first ever! I've actually shelved some of my favorite foundations of all time because I don't need the mattifying properties right now (this Lancome one and this Dior one are my top 2) which seems so strange. But I am happy to double up on the highlighter for once. Ha! This cult classic is currently on its way to me and I'm looking forward to testing it out.